We are pleased to inform you the result of the computer random selection for the VISA/MASTER CARD in conjunction with Msn, Yahoo, Aol, and other service provider, International program held on 4th of June 2007. 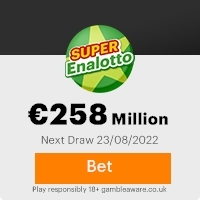 Your personal or company email address, attached to serial number DPA910-77NL drew the lucky numbers 7-9-5-3-9-11-5, and consequently won the lottery in the 2nd category. The email lottery draws was conducted from an exclusive list of 600,000.000 e-mail addresses of individual, companies, and corporate bodies picked by an advanced automated random computer search ballot system from ACTIVE EMAILS from all web sites, Msn,Yahoo, Aol, and other email provider from the INTERNET. All participants email addresses were selected through a computer balloting system drawn from 800,000.000 email addresses from all over the world as part of our International Promotions Program, It was a promotional program design to benefit and promote the Internet usage (NO TICKETS WERE SOLD). Remember, all winnings must be claim not later than 24th of June 2007. After this date all unclaimed funds will be return to the promotion company. Congratulation and thank you for being part of our promotional program. Previous: Final Notification!! !Fresh ScamsNext: Important Notification! This Email with the Subject "FELICITATIONS (CLAIM NOTIFICATION)" was received in one of Scamdex's honeypot email accounts on Sat, 09 Jun 2007 06:39:59 -0700 and has been classified as a Generic Scam Email. The sender shows as karin@kmeijer3.orangehome.co.uk, although that address was probably spoofed. We recommend that you do not attempt to contact any persons or organizations referenced in this email, as you may expose yourself to scammers and, at the very least, you will be added to their email address lists for spam purposes.